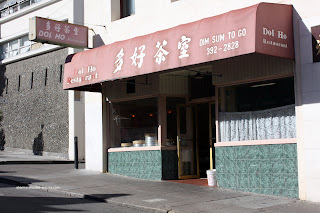 Originally, our plan was to hit up Yank Sing in SOMA for our Dim Sum adventure during our stay in San Francisco. However, for some reason or another, we decided to change it up. Rather than relaxing in an upscale dining room with pricey Dim Sum, we ended up heading over to Chinatown instead. In the pouring rain no less! 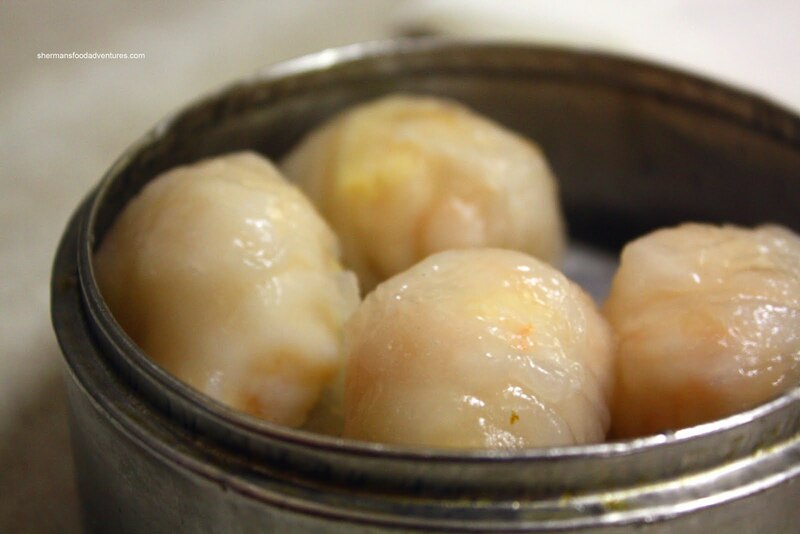 If Yank Sing is the fine-dining equivalent of Dim Sum, then our choice of eats would be the diviest of dives. Dol Ho can be seen as the antithesis of Yank Sing (or Mayflower and Zen Pennisula). Let's just say that white glove service is not available. In fact, there are no white tablecloths either - let alone white anything since everything is a shade of gray or light brown... Service? Looked more like self-serve with the tea and utensils. At one point, we were wondering if they knew we existed. Fortunately, we speak Cantonese and communication was not a problem. However, if one didn't, I can see a whole lot of confusion in their future. That is further exacerbated by the lack of any written menus, in either language! Well, they don't really need'em since most of the clientele are locals. Oh yeah, Kim and I were probably a good 20 years+ younger than the average customer. Definitely brings back memories of my childhood when I had Dim Sum in San Francisco. I remember my grandparents taking me to Chinatown for ol' skool eats (I guess modern back then?). Hmm... in fact, I remember my grandfather getting me treats such as pig intestine and sand worms which I snacked on like they were Cheetohs. Now you can see where I get my love for offal and strange food! So we ended up ordering some dishes and to my dismay they didn't have tripe! Hey what type of place is this anyways? No tripe? That's offal! 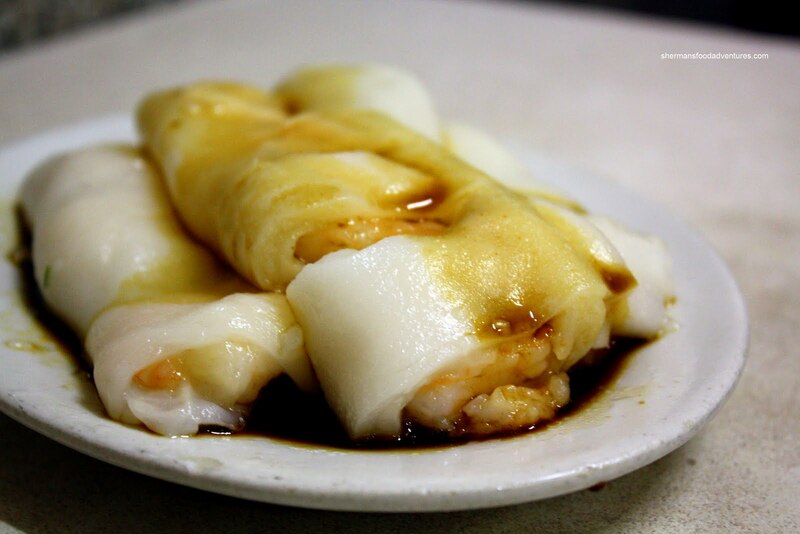 Sorry, dumb pun... Whatever, we started with the classics – Haw Gow and Sui Mai. The Haw Gow was pretty decent considering the venue. Sure, the dumpling skin was slightly thick and overcooked; but the shrimp filling was good (natural shrimp flavour and a nice snap). The Sui Mai, in my opinion was fantastic. Large in size and exhibiting a good combination of hand-cleavered pork, shiitake and shrimp, these dumplings were slightly chewy in texture and full of flavour (thanks to the mushroom). Next up were some of the biggest balls I've ever seen. Er... I mean Beef Meatballs. 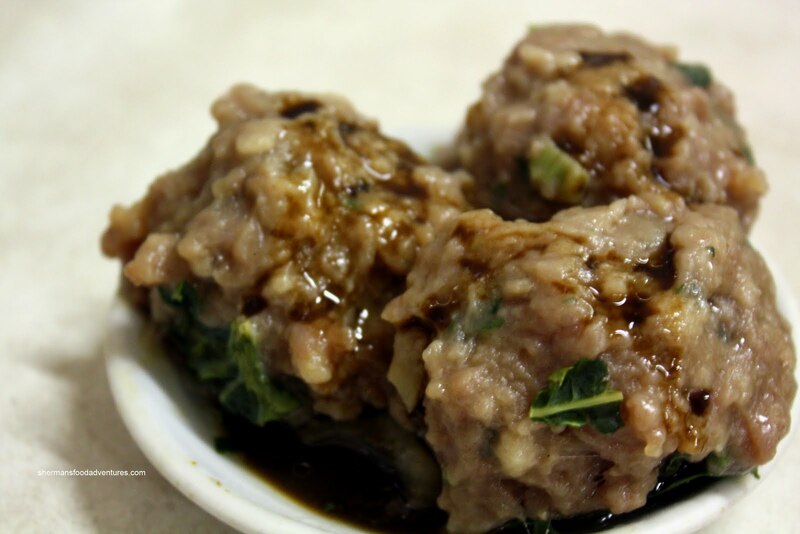 In terms of texture, the meatballs were on the softer side. I would've liked to see more meat texture; but at the very least, there was not a huge amount of baking soda aftertaste. I liked the ample amount of greens and water chestnuts, they were a nice textural addition. Of course, another test of good Dim Sum is the Rice Noodle Roll. We got shrimp and although it looked too thick, the noodle turned out to be quite soft and easy to eat. With that being said, we would've preferred it to be thinner. The shrimp was quite nice having a nice snap texture. We also got the Phoenix Talons (or chicken feet). Generally, these are fried before they are steamed with an oyster sauce-based glaze. This particular version was lightly fried; thus retaining much of the natural texture of the skin and gelatin underneath. 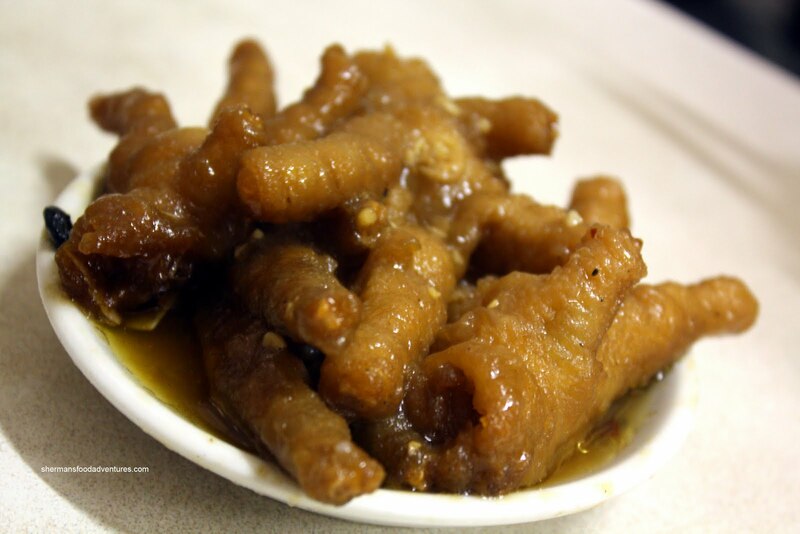 It was more like boiled chicken feet than fried. However, it was good in its own ways, especially since it was so soft. Flavourwise, it was not salty and I could still taste the “chickeness”. Call it the power of suggestion as we got an order of the Steamed Spareribs on the account everyone else seemed to have ordered it. The meat was good with a nice bounce and chewiness. Not too much fat or cartilage present. 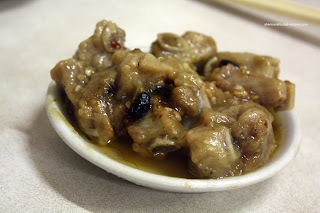 It was only moderately-seasoned; hence we could still taste pork. 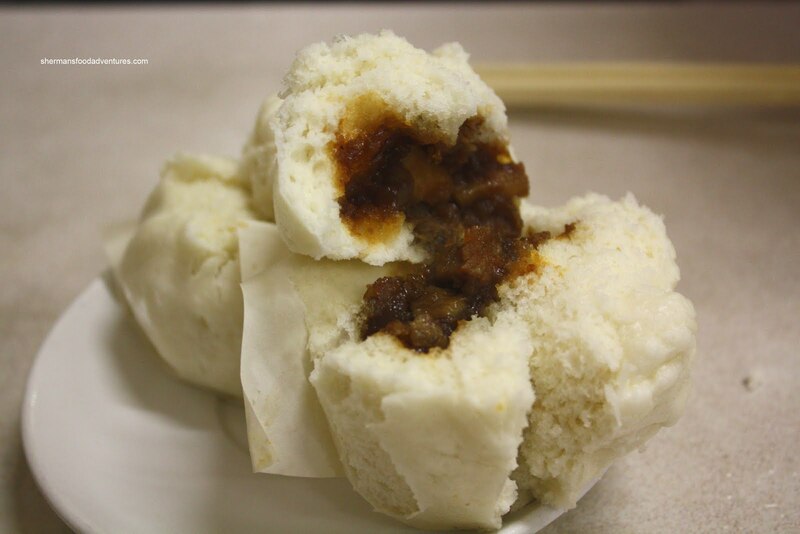 On the topic of pork, we got an order of the BBQ Pork Buns. The bun itself was a bit on the crumbly side where it began to fall apart when we split it open. Not a huge problem though. I liked the BBQ pork filling. It was slightly sweet with a good amount of savouriness. So with all this food, the total bill came to a little over $17.00 including tax. Sure, the place is a dive which seems to be in a time warp from the 70's; but honestly, the food is decent especially for the price. Yah, service is none-existent with ambiance that would rival a dirty bingo hall. The customers here are probably the average age of bingo players. They just don't play bingo. Possibly Mah Jong? Big 2? Now I'm being stereotypical... Anyways, the overall look of the place would worry some people. But give it a chance. 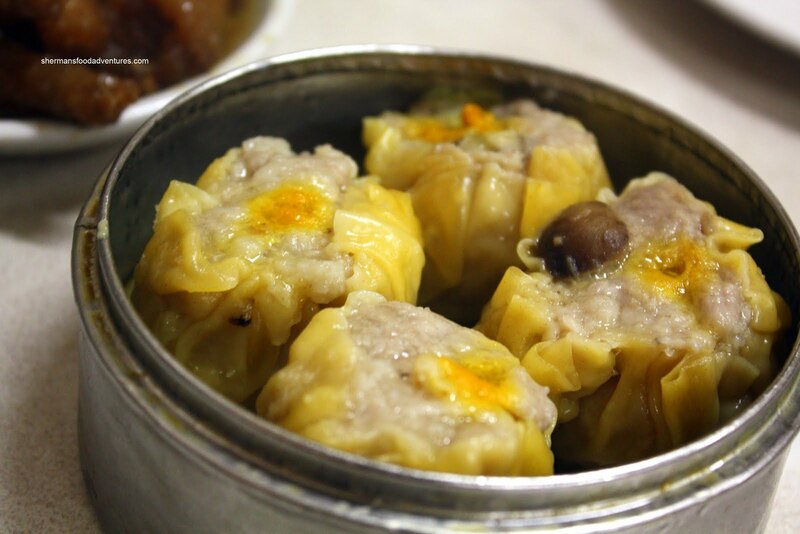 Just try to phonetically remember some of your favourite Dim Sum dishes in Cantonese before you go. Oh, and don't be shy, you will most likely have to share a table. Kate, okay deal! I love Clement Street!